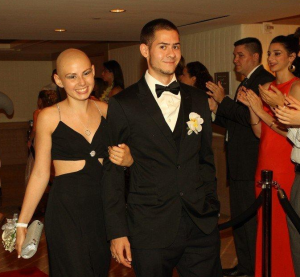 Over 200 kids, who are currently or have received cancer treatment, along with their guests, walked the red carpet in style across from Fort Lauderdale Beach for a Prom night they will never forget. 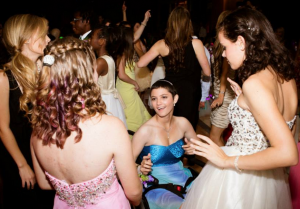 Many teens that battle cancer are unable to attend prom due to treatment or because they have had to leave high school to recover. A Prom To Remember is an opportunity for these kids to celebrate the gift of life and forget about their battle with cancer for an evening. Thanks to sponsors and volunteers, the boys sported Tuxedoes, the girls wore dresses and got their hair done, limousine transportation, prom photos, food, entertainment and much more was all provided for the special guests. Once the ladies arrived they were met and escorted down the red carpet by Sports figures from the Miami Dolphins like Kicker Dan Carpenter and long snapper John Denney who were present in last years Prom. This year Carpenter convinced center Mike Pouncey, Brent Grimes, Olivier Vernon, Brandon Fields, Lamar Miller and Nate Garner to join him and be red carpet escorts to some very lucky ladies. Thanks to the many South Florida partners and sponsors of A Prom to Remember like: Baptist Medical Plazas, Blue Martini, Boasting BiZ – SEO Fort Lauderdale, Business Bragger, Broward Health, Doctors Choice Pharmacy, Florida Panthers, Macys, Pepsi, Payless Shoes, Chocolate Fountains of South Florida, The Ritz-Carlton, Fort Lauderdale and Walgreens the children had a magical night. The kids from the tri-county area came from 8 hospitals including Chris Evert Children’sHospital, Joe DiMaggio Children’s Hospital, Miami Children’s Hospital, Baptist Children’s Hospital, Palms West Hospital, St. Mary’s Medical Center and Holtz Children’s Hospital. “I personally was touched from the kindness of that group of thoughtful people that made a magical night happen” said Ivette Carvajal Rassi, a Miami Dade teacher who’s younger cousin went to the event. “They helped make a long lasting memory those kids will never forget”. The Unforgettable Prom Foundation Inc. A Prom To Remember, a local non-profit that hosts the ultimate prom experience for teens battling cancer was founded by Brandon Opre, who decided he wanted to create a special memory for teenagers who are battling cancer. And to offer them an experience they typically miss out on due to their illness: prom night, the most anticipated night of our high school lives. 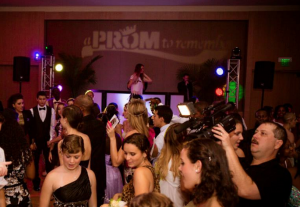 These unique proms are currently held in Fort Lauderdale, Florida, and Cleveland, Ohio, but there are plans for expansion across the nation. For more information, visit http://www.aPromToRemember.org and http://www.facebook.com/apromtoremember, or contact Brandon Opre at 877-385-7766. Photos provided by a Prom To Remember. This entry was posted in News / PR and tagged A prom to remember, Charity Event by Miguel Mendez. Bookmark the permalink.